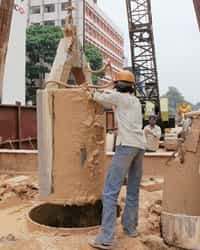 Work on the Metro project in Bangalore’s MG Road. Bangalore Metro Rail Corp. Ltd (BMRCL) has short-listed four firms— Siemens AG of Germany, Bombardier Transportation GmbH, Alstom Projects India Ltd, the local subsidiary of France’s Alstom Corp., and state-run BEML Ltd—to build and supply coaches for the local rail network it is buiding in India’s technology hub. “By February, we should be finalizing a vendor," saidV. Madhu, managing director of BMRCL. “Cost comparisons with Delhi and Bangalore will be difficult. It depends on the gauge and the type of coaches," said Anuj Dayal, spokesman for the Delhi Metro Rail Corp. Ltd, which operates a similar train service in India’s capital. The Bangalore Metro has adopted a standard gauge in the 33km route, of which 6.73km will be underground, while the Delhi Metro uses a broader gauge that needs heavier coaches. BEML chairman and managing director V. R. S. Natarajan said the company was “confident of winning" the bid to supply coaches. BEML is a defence equipment and coach maker. It has licensed technology to make coaches from Korea’s Rotem Co., which is part of the Hyundai Motor Group. BEML’s bid has been made through a consortium that includes Rotem and Japan’s Mitsubishi Corp. The company supplied 180 coaches for the first phase of the Delhi Metro. Another shortlisted bidder with a Delhi Metro connection is Bombardier Transportation India which, in July, won a contract to supply 340 coaches for the second phase of the project in the Capital. “Shortlisting is the initial process. It is a long haul forward," said Rajeev Jyoti, managing director of Bombardier Transportation India. While BEML has a factory at Bangalore itself, Bombardier has one at Baroda. BMRCL has asked suppliers to create a local manufacturing base because this could bring down costs. “Ultimately, it should be economical for us," Bangalore Metro’s Madhu said. Bangalore will be the second city in India after Delhi to build a modern Metro rail system, aimed at easing the bumper-to-bumper traffic on roads. Nearly one in every two of Bangalore’s 6.5 million residents owns a two-wheeler or a car (or both); 1,000 vehicles are added every day to the three million already on the road.